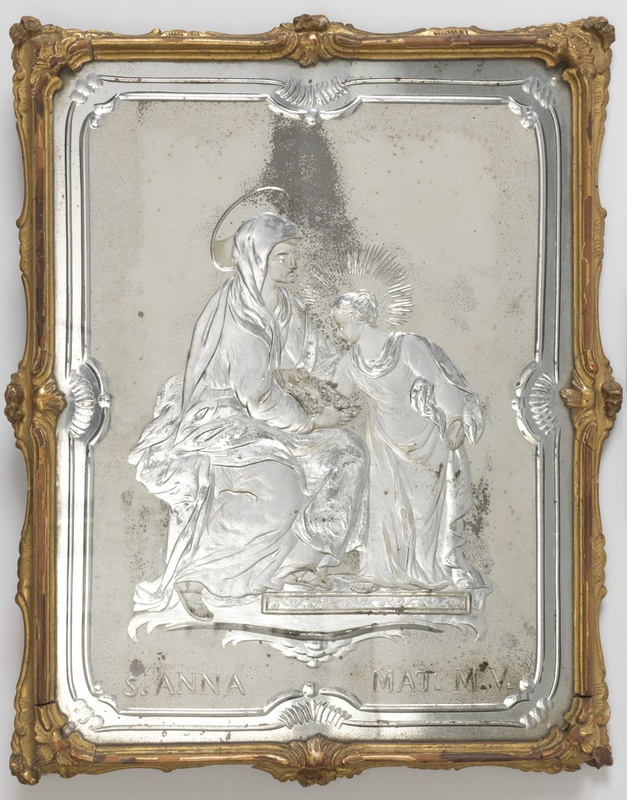 Venetian glass-making is not the only tradition observed in this engraved mirror, although engraved mirrors were popular there for both domestic and religious use in the seventeenth and eighteenth centuries. This piece also displays a powerful and historically popular image of the Virgin Mary standing alongside her mother, St. Anne. The religious rhetoric did not always include such frequent use of female characters but St. Anne had a larger part to play in the New Testament, arguably to create a greater lineage for Jesus. During the middle ages, scenes of the Virgin and St. Anne were often portrayed in devotional objects. To include a female narrative in Christian didactic allowed a subliminal lesson to be learned by women in society. There are four popular narratives that frequently occurred in religious depictions during the fifteenth century including the Nativity, Adoration of the Magi, Crucifixion, and Last Judgment. Cultural shifts during the fourteenth and fifteenth centuries permitted the Virgin a more central role in apocryphal gospels and she therefore assumed a more frequent role in artwork. Interest in Mary and her holy lineage also became a focus and St. Anne became part of holy rhetoric. Greatness was being attributed to the mother of the Savior; however, to an extent she was reduced to the image of the subdued and humble woman used encourage certain behaviors. The figures of St. Anne and Mary taught women how to be good and moral. Their representations acted as role models for nuns, in particular. This image of Mary and St. Anne, bound with the traditional craft of glass-making, is a lens into Italian culture. Nationality, family, and lineage are of supreme importance and each theme can be traced throughout the ages. Additionally, this engraved mirrored glass is one of a pair. Its opposite, seen below, bears an image of Pope Julius II, another indication of the aforementioned themes to enrich religious vernacular. Both mirrors are included in the exhibition, Thom Browne Selects. ← Here’s Looking at You!